Terrace Bay Curling Club is open to the region, individuals and groups! The Terrace Bay Curling Club is a fun filled environment for new curlers, expert curlers, and everyone in between. We offer a variety of leagues and bonspiels that will get you active and meet new friends. We are located in the Terrace Bay Community Centre at 1 Selkirk Avenue. Open League – Thursday nights – 7:00 pm. The Curling Club or Bar/Lounge are also available for rental by groups or events. Want to Learn to Curl? 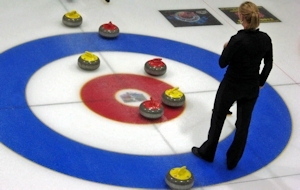 We are always looking to help beginner curlers learn the sport. We are planning on holding a beginners curling clinic to teach the necessary skills and our friendly curlers in the leagues will be more than willing to offer advice. A Great Curling Shot! Look How Much Fun They Are Having! Difficulty Getting Down to the Ice? We have Curling Sticks and sliding crutches available to aid in delivery of the rock if needed, and we do have a few members that use them. Sliders and brushes are also available for members. For information contact Scott Adams at 825-9151. To contact the Curling Club at the Community Centre, please call 825-3315, x238. Like us on for updates on curling!